In life, nothing lasts forever and that is true about the human body. The decades of lifting, bending, twisting and turning really takes a huge toll on your body as well as your neck. Taking into consideration all the unwanted stress, it is not that surprising to know that a majority of individuals (which is about two-third) go through the experience of having neck pain at a certain point in their life. Do you know that cervical disc disease is just or more beyond the pain in your neck? The degenerative process can sometimes lead to excruciating and radiating pain, even leading to weakness and numbness to your arm, shoulder, and hands. Most importantly, this weakness and numbness present in the arm, shoulders and hand can be extremely serious. Plus, this loss of mobility and discomfort will have a deep impact on your family, career, and even quality of life. Being a complex structure, cervical spine can support one’s head which weighs about 15 or more pounds, when one moves in various direction. Unlike other spine region of spine, the cervical spine provides much freedom and movement. So, this combination with the mobility and complexity can make the neck prone to injuries and even pain. The complex structure of the cervical spine has about 7 tiny vertebrae and even contains inter vertebral disc which can absorb the shock, and the spinal cord, joints, vascular elements, 8 nerve roots, ligaments and 32 muscles. Here the nerve will root the stem, and that too from the spinal cord. It would be like tree branches and moves from the foramen present in the vertebrae. Each of the root will transmit nerve impulses (which are nothing but signals) right from and to the brain, arms, shoulder and chest. Now, the vascular system will be having four arteries along with veins that run through the neck. This helps in the blood circulation among the brain and heart. Ligaments, muscles and joints assist in making the movement and will help in stabilizing the structure. With regards to neck mobility, it is matchless. Most doctors feel that it can make head movement in about 90 degree of flexion (i.e. in the forward motion), 90 degree of extension (which is in the backward motion), somewhat 120 degree of tilting over the shoulder and about 180 degree of rotation (which is from side to side). Do you know that the cervical spine present in your neck is made of seven bone? These seven individual bones are called as vertebrae, and most importantly, they are separated by discs which have cushion-based gel system filled inside them. Now, your cervical discs can easily stabilize your neck, and this allows it to turn smoothly right from one side to another and even bend forward right to the back. Without the presences of the disc, the spine would be very much stiff. Most doctors believe that the disc is the one which allow the body to make movement in the way that we really want. Plus, it even provides a cushioning feeling to the body, somewhat acting like a shock absorber. Slowly, these so-called natural shock absorbers will easily get worn out and there are chances that it will degenerate. So, what happens is that the space among the vertebrae will get narrow down and the nerve roots gets very much pinched. This process is called as cervical degenerative disc disease. There are researches which show that somewhat 25% of the individuals who are suffering from this symptom lies in the age group of under 40 and there is a high possibility that 60% of them lie in the age of more than 40 and they will be having certain degree of degenerative disc disease. So, what happens is that the as the degenerative disc diseases starts to progress, the neck will be somewhat less flexible. Therefore, sometimes you might feel a certain kind of neck pain and stiffness, which is more common right at the end of a day. Keep in mind that when the disc gets broken up or it bulges out, there is an extensive pressure right on the nerve root or spinal code. This is called slipped disc or herniated disc. 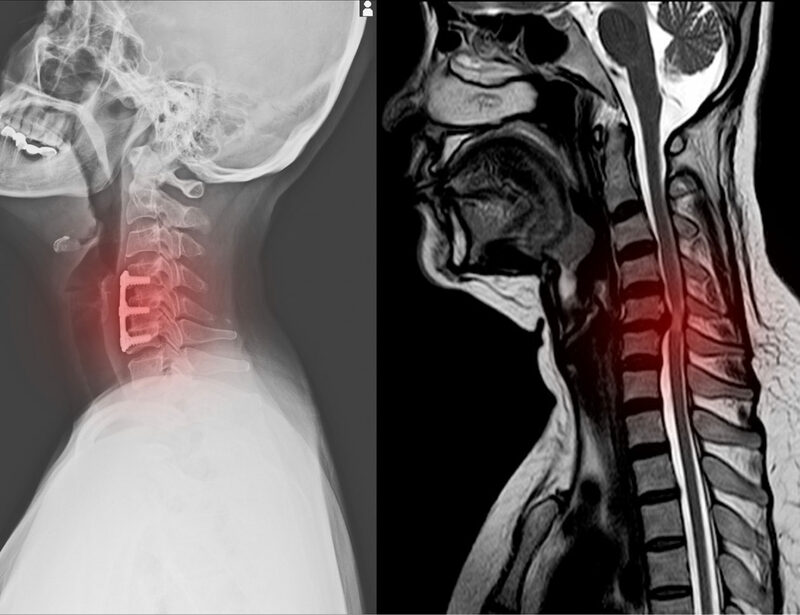 Even though the disease – cervical disc is a very slow process, there are chances that the herniated disc can happen immediately after there is trauma or injury to the neck. Sometimes the obvious or most common symptom of the cervical degenerative disc will be stiff neck and neck pain. So, what happens is that when such conditions occur or simply accumulates there one or many nerves will be running through the spinal cord and this might lead to numbness, pain or extensive weakness which radiates down to the arm, shoulder, and hand. ∙ Accidents and Injury – Not many people know that whiplash is one of the major and common injury which is sustained during an auto accident. Some people or you can say most doctors term this as hyper flexion or hyper extension injury as the head will be forced to move back or there are chances it will be pushed forward rapidly and that too more than the normal range of motion of the neck. Here the muscles will react by contracting and tightening, which will make the muscles fatigue, thereby resulting in stiffness and pain. ∙ Aging – As one starts to get older, they might start to suffer from degenerative disorders like spinal stenosis, osteoarthritis, and even degenerative disc diseases which affects the spine immensely. Unlike other disorders, osteoarthritis is one of the major joint disorder which causes immense progressive deterioration of the cartilage. Here, the body will react by the formation of the new bone which is called as osteophytes (which is called as bone spurs) and this will impact the joint motion of the bone. Spinal stenosis will lead to tiny neural passageway, foramen, and this will make it narrow which in turn will compress and entrap the nerve roots. Now the stenosis will lead to pain in the shoulder, arm and neck and sometimes will lead to numbness when the nerves are not functioning in a proper manner. The disease DDD (Degenerative Disc Disease) will make the inter vertebral discs to be less hydrated. This will in turn lead to reducing the elasticity of the disc and even the height. Hence, overtime, the disc will just get bulged and herniate and this will lead to extreme pain, numbness and tingling sensation. ∙ Daily Activities – Sometimes obesity, weak abdominal muscle and poor posture can really affect the balance of the spine often leading to the neck getting bent forward. This is to compensate for the forward moving posture. Even emotional tension and stress will make the muscles to get tighten and contract that will lead to the neck getting affected. In such case, it is better to go for medical treatment. ∙ Stiffness of Ligament – There are chances that the tough cords which are connecting the spinal bones of the body with one other can sometimes become stiffer as time passes. This can seriously affect the movement of your neck and even make the neck feel tight. ∙ Herniated Discs – You know at times the spinal discs of your body will develop cracks. This will then lead to leakage of the cushioning material present internal. So, what happens is that the material will get pressed down to the spinal cord and nerves which will show symptoms like numbness in the arms and even pain which can radiate to the arm. Unlike other diseases, the biggest risk involved in getting cervical spondylosis is aging. As you age, the changes in your neck will lead to the development of the cervical spondylosis. Dehydration, disc herniation, and bone spurs are the results of aging. ∙ Holding the neck for a long time in an uncomfortable position and that too for prolonged period or even repeating the same neck moment all around the day (which is called as repetitive stress). ∙ Work related activities can even lead to extra strain on the neck which happens because of heavy lifting. There aren’t any specific symptoms for people who are suffering from cervical spondylosis. Now if the symptoms do happen, then it can range from a mild to severe, and this will occur suddenly or develop gradually. There are other common symptoms like weakness of the muscles. The weakness of the muscles will make it harder for an individual to lift the arm or grasp any object in a firm manner. ∙ Stiff neck becoming worse. ∙ Numbness or tingling of the neck which can even affect the arms and shoulders, and there are some chances that it will even happen in leg. There are symptoms which might happens less frequently like loss of bladder or loss of balance or even losing the bowel control. In case of such symptoms it is important that you take medical attention fast. There are certain activities which can be very much painful for the neck like doing a specific swimming stroke or craning the neck forward while viewing the computer monitor. You can reduce the pain if you refrain your neck from m or modify any activity for a few days or weeks. Also, if you have a robust posture (i.e. rather than flexing the neck while you are driving, slouching while you are sitting, viewing the neck, etc) is what you need. Also, it would be beneficial for your disc health if you follow proper eating habits, avoid smoking, and stay hydrated. Sometimes it might be a better part if you go for over-the-counter pain relievers like ibuprofen (like Motrin and Advil), acetaminophen (like Tylenol), etc. It these aren’t strong, then you might go for a stronger medication like muscle relaxants or oral steroids (like Vicodin). There are other major options like taking injection which delivers the medication directly to the required part of the neck, like the common cervical epidural steroid injection or the cervical facet injection. There are certain people who get good amount of relief when they apply heated gel or ice pack to the uncomfortable areas of the neck. If you check out majority of the non-surgical treatment related to neck pain consist of doing stretching and exercising. A casual appointment with trained health professional or physical therapist will provide you with the required exercising and stretching regime, especially the ones that is apt for the specific needs of the patient. Most of the time, the flexibility and strength increasing of the neck will reduces the chances of getting the pain. If you are suffering from the C-Spine issue, then it means that you are really suffering from a disease which is curable. But always keep in mind that it is better if you take a doctor’s opinion before going for any medication. Most people simply follow certain procedure and end up regretting.